Today is the 50th anniversary of Medicare, an essential program in our healthcare system. On this auspicious occasion, I’d like to revisit one of the most controversial proposed changes to Medicare: death panels. “End-of-life counseling”, also known as “advance care planning”, was included in the original draft of Obamacare. Unfortunately, due to politicians framing it as “death panels”, it got taken out of the final bill. Not surprisingly, “death panels” were voted “Lie of the Year” by Politifact in 2009. Doctor: Look, you’re going to die eventually. Let’s talk about when it’s ok for us to stop trying to keep you alive. You: Why wouldn’t I want to be kept alive as long as possible? Doctor: You might want to be kept alive, and that’s your choice, but often there comes a point where the doctors at the hospital know you’re about to die, but they legally have to keep trying to keep you alive. You: Well that seems like a waste. I guess it’d be fine to pull the plug then. But if I had cancer, I’d want as much treatment as possible. Doctor: Actually, chemo and radiation therapy can be quite painful. If there’s a very low chance of survival, would you really want to go through with it? This conversation would obviously go differently for each person, but the goal of the conversation is to form an “advance care directive.” Do you want to be kept alive as long as possible at all costs? Do you want the plug pulled when the doctors are certain you’ll never wake up again? This directive expresses your medical wishes for end-of-life care. Although your doctor is there to educate you, they are not there to make decisions for you. Think of it as a death panel of 1: you. You get to decide your own fate. You can base that decision on your religious beliefs, on detailed cost/benefit analysis of the medical care, or even with a Ouija board if you want. Everyone dies. Talk to your doctor to learn what you’re dealing with. And if you want to help your elderly loved ones make their own health care decisions, you can support the rule change that the CMS is currently proposing. There’s a lot of bureaucratic legalese there, but under “ADVANCE CARE PLANNING” is a provision for paying doctors for end-of-life counseling. To let the government know how you feel about this issue, you can publicly comment here on the rule change from now until September 8, 2015. Section II.I.4.c (Roman numeral 2, letter I) is the specific section that deals with advance care planning codes. To let us know how you feel, comment here or on twitter or Facebook, and we’ll let the NSA know to pass your comment along to CMS. Over the past month, the Science ACEs blog has been running articles on mental health. If you’ve been reading along with us, you know that mental health issues are near and dear to many of our hearts, as they may be to yours. As scientists, we are interested in the biology and physiology and chemistry of mental illness. As people, we are interested in loving and understanding and empathizing with others. We hope that we have been able to tell you something you didn’t know before, relate to your struggles, or just make mental health and mental illness a little more interesting and a little less scary. A lot of ACEs participated as authors in this feature, but just as important were the ACEs who worked “behind the scenes,” editing articles and suggesting topics. A lot of times this involved finding times to meet each other between experiments or staying up late to read each other’s work, but the feature was important to all of us and we wanted to put forward our best ideas. The authors are grateful to everyone who put in the time and energy to make that happen. We hope you’ll keep reading as we move on to other aspects of our awesome, scientific world – and as always, reach out to us if you want to ask a question, have an idea for us to write about, or want to say hi! Leave a comment, email us at science.aces15@gmail.com, or tweet at us @scienceaces! This month we’ve been discussing a variety of mental health issues from mental illness to neuroplasticity to how Hollywood portrays mental health. Throughout all of these discussions, though, I’ve been left wondering what is normal in regards to mental health. Based on this definition, a person who is mentally ‘normal’ has an average brain, average mind, and average behavior. A mentally ‘normal’ person is similar to most other people. Science has revealed what the structure of the average brain is, what the average levels of neurotransmitters (brain chemicals) are, how the average brain processes and learns new information, and how the average person behaves. While I am a scientist and value all the knowledge that science has given us, I am not a fan of the above definition of normal. This definition implies that people who are not average are somehow abnormal, are somehow less than everyone else. This idea of normality adds fuel to the stigmas associated with mental illness: if people suffering from mental illness are less than normal, then it’s okay to disrespect them. Am I happy with the direction my life is heading? Are my friends/family/doctors/et cetera expressing concerns about me and my life choices? Am I at risk of hurting myself or others? All of us, we are all different people. We come from different backgrounds, different cultures. We all have different hopes and dreams. We all have different strengths and talents. We all have a different definition of what normal is. But despite all of our differences, we all have one very important thing in common: we are all human. Human – that’s the same “typical state or condition” for each of us; thus, according to the first definition of normal that I shared, being human is being normal. Let me repeat that, being human is being normal. You are human – you are normal, and no matter what else is going on in your life, you deserve respect and dignity. Here is a fun experiment. Below is a clip from Futurama, a clip from The Notebook, a clip from Field of Dreams, a clip from Titanic, and the ending to Toy Story 3. Logically speaking, at least one of these clips should make you sad. At the same time, you may not understand why people would find the other ones to be sad. Also logically speaking, a plurality of you are somewhere in public. Perhaps you are crying. Look around and notice how people respond to you. Here is another fun experiment. Next time you are walking somewhere, you may run into a person you know. As you pass each other, they will inevitably ask, “How are you?” We all know what answer to expect. Good. Ok. Not bad. Those are all acceptable answers. But what if you instead answer with a straight face, “Really bad. I’m not having a good week and I don’t know what I am going to do.” Then after the appropriate amount of seconds, smile and say, “Just kidding.” It’s not really a funny joke, but it makes a point. We expect everyone to hide their emotions when you casually pass in the hall. We expect everyone to put on a happy face. To an extent, we are expected to put on a happy face in public. Whatever emotions and troubles we may have, we keep them buried inside. It is only in private life that the façade is allowed to break. We can weep when no one but those closest to us are watching. I am leading to the fact that we may not always be aware of the mental health issues others, even our closest friends, struggle with. However, we need to have empathy. I sum it up as, “Are we willing to let our friends to take off the happy face when they are around us?” “Will we give them what they need even if we don’t understand?” People need to be vulnerable; are we letting them? The Executive Editor of Cracked.com, David Wong, wrote an amazing article after the passing of Robin Williams about the struggles faced by funny people. Among his many excellent points, he argues that the “clown” persona is a defense mechanism and the best thing you can do for a funny person is be there for them when they don’t want to be funny. An account of Owen Wilson’s suicide attempt points out how surprising the attempt was for the public, but then points out how many people weren’t privy to the struggles he faced. In Jim Norton’s own tribute to Robin Williams, he notes how darkness often surrounds the funniest people. Even those responsible for providing laughter need time to be vulnerable. To indirectly quote G.K. Chesterton: the religion of cheerfulness is a cruel religion. Now I am not saying that we must be vulnerable with everyone. Vulnerability is something that is earned with trust. It is like a superhero taking off their mask, letting someone see the face you hide from the rest of the world. As such, when someone “needs to talk” or “needs some alone time,” see it as a sign that he or she trusts you enough to be honest with their emotions. When I first heard the peppy 1960s jazz song “Put on a Happy Face,” it was accompanied by a video of clowns getting ready for a show. Thus I have always connected the idea of a happy face to a clown. The smile is literally painted across your mouth, so you smile even when you desperately don’t want to. Otherwise someone might see the person beneath the face. So next time you see someone you know in public whose smile looks like it was painted on too well, stop a second. Ask “How are you really doing?” because they might give an honest answer. I am a firm believer in the power of our minds to not only cope with (most) mental diseases, but also to eliminate them. I say this as a future physician, scientist, and someone who has spent much of my life dealing with severe debilitating anxiety and depression. These days, most people I know would describe me as fairly confident and optimistic, but growing up, most people, including myself, doubted I could ever be a normal part of society. However, through various techniques, culminating most recently in mindfulness, I was able to overcome my limitations. This is why I want to share my journey through mental health treatment, because I truly believe that if I could accomplish this much, anyone can. The first major sign that my anxiety was abnormally high even as a young child was when I had an existential crisis at the age of 5. When my great-aunt died and I realized death was permanent, I began to believe that I was going to die and everything would kill me. I developed a specific ritualistic prayer that I had to say every night in exactly the same way. If I got it wrong I would have to repeat it until I said it correctly at least 5 times or else I knew that I or someone I cared about would die. This prayer ritual continued all the way through high school. In elementary school, my anxiety manifested as selective mutism. The first time most of my teachers and classmates heard my voice was when I prerecorded presentations on a tape recorder at home to play in class because I physically could not speak in school. My parents, scared for my future, brought me to the National Institutes of Health (NIH) for evaluation. They were told that this was not normal child shyness and without treatment, it might never resolve. They wanted to enroll me in a study to test the effectiveness of antidepressants combined with therapy on my condition. If you are curious about this condition and these NIH studies, check out this article, which pretty much describes my childhood and the doctor who did these studies. Ultimately, my parents were scared to put such a young child on drugs, and so my experiences with different techniques of therapy began, including psychoanalysis, cognitive therapy, and behavioral therapy. To treat the selective mutism, my parents started with behavioral exposure therapy, which uses desensitization techniques to reduce specific phobias that cause anxieties. The first experiment was to try to talk to one of my teachers on the phone from the comfort of my own home, a place I was able to speak normally. My third-grade teacher would call me over and over again, but for the longest time any words I tried to say to him came out as random grunts. Then one day I got one word out. I think it was “Hi.” I’m pretty sure as soon as I realized I had spoken I cowered in horror thinking the universe would end, but nothing bad happened. Over time I was able to speak with my teacher more and more over the phone. I never was able to talk in his class at school, but I had made a first step. The next year, with the help of one of my best friends who transferred to my school, I was able to start talking in class, and even occasionally raising my hand to answer questions. I was still a pretty anxious kid, and when my best friend moved away, this manifested again in silence, withdrawal, depression, and the creation of vivid fantasy worlds to escape into. Psychotherapy couldn’t help me much, because I couldn’t analyze something that seemed like it had always been a part of me. My anxiety and obsessive behavior continued through high school, where I became incredibly isolated and developed anorexia and severe depression. At the beginning of college I made a decision that I would not maintain these habits, and I continued my own exposure therapy, talking to strangers as much as I could. I was incredibly awkward, talking so quietly that people couldn’t hear me or forgetting to tell people my name. I would look at the ground and not make eye contact, but at least I was talking to people. It was a huge step, and because of it I had a lot of success developing a healthy social circle. I was still frequently plagued by bouts of anxiety and depression that I couldn’t seem to escape, despite continuing therapy. Even through the anxiety and depression, my dream was always to be a doctor and a scientist, saving the world by researching cures for deadly diseases and using this research to directly improve the lives of patients. However, my anxiety culminated in the inability to get into an MD/PhD program because when I interviewed, I struggled to talk and would frequently burst into tears. I took two years off after college to do research and to work on my mental health. I continued with psychotherapy and behavioral cognitive therapy and eventually began taking selective serotonin reuptake inhibitors (SSRIs) for my anxiety and depression. During this time I discovered the field of Positive Psychology, which was developed by Dr. Martin Seligman, an academic psychology researcher at the University of Pennsylvania. I read his book, “Learned Optimism,” which describes his approaches, focusing on positive emotions (content with the past, happy in the present, hopeful for the future), positive individual traits (establishing your own strengths and virtues), and positive institutions (creating positive supportive communities for yourself). As the title suggests, the book describes how you can learn to be optimistic, rewiring your brain to become something new. The idea that you could change your brain and personality was fascinating to me, and I began realizing how much more control we have over ourselves than anxiety would let us believe. Ironically, around this time my therapist told me she was not very optimistic about my chances to get into MD/PhD programs due to my anxiety, and she cautioned me to prepare myself for the worst. But, inspired by the field of positive psychology (which she didn’t practice), I decided that I could be different and that anxiety didn’t have to stop me from achieving my goals. I went on my interviews and got into many MD/PhD programs. I wish I could say this was the end of anxiety ruling my life, but I still had a long way to go. During my early years in school, I continued psychotherapy, behavioral cognitive therapy, and medications to manage my anxiety, but the stresses of medical school and graduate school frequently overwhelmed me. In the clinics, sometimes it felt like selective mutism hit me again as I struggled to present patients to intimidating doctors. While other students would just stumble a little under the pressure, I would burst into tears and start hyperventilating when I couldn’t get words out. When I started doing PhD work, I would sometimes get so anxious about experiments and expectations I would stop showing up to lab to avoid facing everything I was failing at. The ultimate blow that threw me into my deepest depression yet was breaking my ankle. I required surgery and was immobilized for 2 months. I had so much time alone with my thoughts of failure and disappointment, and I physically struggled with the pain and inability to take care of myself. I took a leave of absence, and as a last ditch attempt before giving up on everything, I began exploring a different field of mental health treatment, mindfulness. I discovered mindfulness through my dad, who sent me books about it while I was sitting at home depressed with my broken ankle. One of these books discussed mindfulness in the context of Qigong, a Chinese art that uses movement for meditation and healing. When I searched more about it, I found that there was a Shaolin temple near my home in Houston with a 31st generation Shaolin monk who practiced healing qigong. On a whim, I reached out to Grandmaster Shi De Shan and started private sessions hoping to help heal both my ankle and my mental illness. He taught me how to meditate and practice mindfulness. All the techniques I have discussed above focus on endlessly analyzing thoughts and emotions, identifying them as a part of who we are. In these methods, we can learn to live with anxiety and depression by understanding and acknowledging these parts of ourselves. Mindfulness differs by identifying thoughts and emotions as what we experience. We are not our depression or anxiety. Instead, they come from habits we have built up over time to cope with the environment around us. And because they are not who we are, we should be able to observe our thoughts and associated body sensations in an objective, non-judgmental way. Rather than analyzing our thoughts, we simply meditate and watch them float through our heads, realizing how fleeting they are. Then we let them go, floating back out of our head the way they came in, without evaluating, judging, or adding to them. To many people this sounds like a bunch of new age-y nonsense, but there is a significant amount of evidence that techniques based on mindfulness are very successful. Regular users of mindfulness meditation have less brain activity in their limbic system, the part of the brain associated with aggression, anxiety, anger, and development of posttraumatic stress disorder. When measuring physiological and emotional response to stressors, mindfulness meditators have a much faster recovery than nonmeditators. Mindfulness may be more effective than behavioral or cognitive therapy in changing the fear response to phobias as well as general anxiety by rewiring the brain to sever the connection between the fear inducer and the fear reaction. Interestingly, certain types of mindfulness training can diminish the disproportionate fight-or-flight response associated with high anxiety states. In the last year since I began training in mindfulness, my life has changed completely. I have been off my antidepressant medications for over 6 months. I no longer let anxiety control every action I take. I’m slowly releasing every fear that has been holding me back, and I’m watching the magic of life unfold. I’ve found things I’m truly passionate about and I don’t let anxiety stop me from pursuing them. And best of all, I am following my dreams to help as many people as I can and do my part to change the world. When my mind was filled with fear and anxiety all the time, I couldn’t really get enough outside myself to help others. Sure, I still get overwhelmed or anxious sometimes. I have built up a lot of bad anxious habits since I was 5 years old. But overall…everything is awesome! I hope my story inspires you, and together we can use the power of our minds to release our mental illnesses. In most mental disorders, it is unclear how and when things go wrong. The field of neuroscience is still in its infancy, and our understanding of the mechanisms behind mental illnesses is greatly lacking. In many instances, we still don’t know how prescription medicines for mental illnesses work. One thing scientists have uncovered recently, however, is that the brain grows and changes our whole lives. Many neuroscientists are interested in studying these changes to learn how we develop and recover from mental illnesses. Our neurons forms new connections – via projections called axons and dendrites – during normal processes like learning and memory formation, which carry on into old age. Perhaps most surprisingly (and excitingly!) it also appears that adult brains even generate brand-new neurons (neurogenesis). The brain’s ability to change, be it by neurogenesis, axon formation, or even the decay of neural connections, is collectively known as neuroplasticity. Biologists are anxious to study the links between mental health and neuroplasticity both in terms of acquiring the illness and in recovery. Many of these biologists, in search of clues, have turned to the hippocampus. The hippocampus is a brain structure known for its role in memory formation, and it is one of the very few locations where neurogenesis can occur in adults. Even before this was known, hippocampal shrinkage was a well-documented phenomenon in neurological conditions such as Alzheimer’s. More recent studies have also shown decreased hippocampal volume in a number of mood-related disorders, including depression, PTSD, and schizophrenia. Because of this interesting and exciting link between mental illnesses and hippocampal size, some scientists hypothesize that perhaps neuroplasticity – specifically, the loss of neurons in the hippocampus – might be causing these illnesses. For example, some studies have shown that people who are successfully treated for PTSD display increased hippocampal volume. (Other studies have shown no effect, so this question is still up for debate). A study out of Harvard found a potential neuroplasticity-related treatment for negative* symptoms of schizophrenia. The study focused on a particular receptor in the brain called the NMDA receptor, which is located on the surface of neurons and helps relay signals from one neuron to the next. The NMDA receptor is also important for learning, memory, and neuroplasticity. Low NMDA receptor activity is associated with schizophrenia. In order to replicate this aspect of human disease, the research group studied mice with low-activity NMDA receptors. The mice in the study had cognitive deficits and the reduced hippocampal neuroplasticity associated with schizophrenia in humans. The researchers administered to these mice a compound called D-serine, which is naturally synthesized in the brain and activates the NMDA receptor. They found activating the NMDA receptor in this way restored hippocampal neuroplasticity to the mice. In addition, the mice’s behavioral and neurochemical deficits became normalized. The group thus concluded that D-serine treatment may be useful for correcting negative symptoms of schizophrenia in humans by means of improving hippocampal neuroplasticity. Neurogenesis is not the whole answer to why people develop or recover from mental illnesses. It is also not a miracle cure, despite claims you’ve probably read on the internet about “harnessing the power of the brain” to make you smarter. Neuroplasticity is part of a large, complex puzzle. It is novel and fascinating and may even lead scientists to develop effective new medicines, but it is part of a nuanced and detailed system that, really, we are barely beginning to comprehend. As we understand and integrate multiple areas of neuroscience, we will begin to understand this amazing system. This in turn will help us better understand mental illness more thoroughly and give us hope for being able to appropriately treat these complex and as-yet-poorly-understood disorders. *In psychology, “negative” symptoms are emotions or behaviors that should be there but aren’t. In schizophrenia, negative symptoms might include lack of pleasure, social withdrawal, or flat affect. This contrasts with “positive” symptoms, which are behaviors present in individuals with a particular condition but not in the general population. Hallucinations and delusions are two defining positive symptoms of schizophrenia. Most schizophrenia medications treat the positive symptoms while having little effect on negative symptoms, but the negative symptoms often affect an individual’s quality of life at least as much as positive ones. It is therefore vital to develop medications that do treat these somewhat ignored aspects of the disorder. When an activity or skill is second nature to someone, they might say confidently, “I could do it in my sleep!” Sleeping is the embodiment of comfort, rest, and routine for most people. Our internal biological clocks – known as circadian rhythms – silently direct the forces that make it possible for us to drift off or rise to face the new day. But for many people suffering from bipolar disorder, circadian rhythm imbalance may contribute to irregular sleep patterns and even to mood instability. Bipolar disorder is a cyclical disorder. Patients experience phases of intense excitability or irritability known as manic phases, which cycle with depressive phases, periods of time in which sufferers experience depressed mood and low energy. In addition to abnormal mood cycling, people with bipolar disorder often find that their sleep cycle is mysteriously disrupted. They may sleep much less during manic phases and much more during depressive phases. What’s even more curious? At the heart of the story is the metal lithium, a common treatment for bipolar disorder. Scientists don’t fully understand how bipolar disorder works, or how lithium works to treat it. The cool thing about that is that it presents researchers with a unique opportunity to work backwards! Instead of trying to sort out the many different root causes of bipolar disorder – genetic, environmental, life experiences – they can alternatively study how the treatment works in order to find the disease mechanism. In the case of lithium, scientists know that, somehow, it is able to steady the wayward cycles that characterize bipolar disorder. In order to understand how lithium might affect the circadian clock, we need to understand a little about how the circadian clock actually works on a molecular level. At the center, controlling the cycles and rhythms of all the other components of the clock, are two proteins, BMAL and CLOCK. 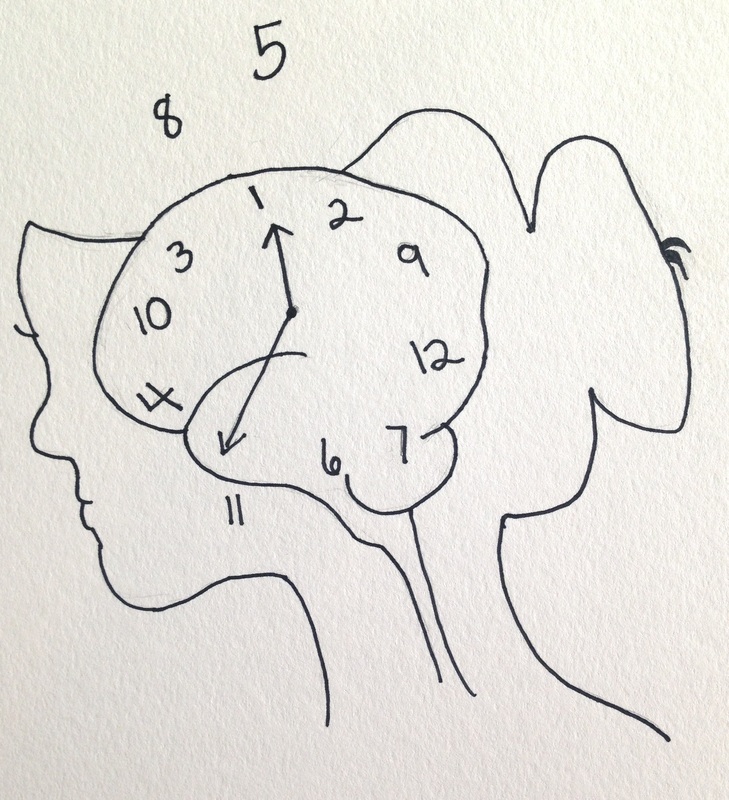 Ultimately, BMAL and CLOCK control the length of a day in your body (they are helped out by natural light). These proteins function as a unit – they can’t do their jobs if they’re apart. BMAL and CLOCK, like any good leaders, listen to their constituents. In the circadian world, this means that other proteins in the molecular clock can interact with and change the behavior of BMAL and CLOCK. One particular protein, called Rev-erb, is especially important in this regard. BMAL and CLOCK, as the leaders of the cycle, provide the system with instructions to make more Rev-erb. In turn, Rev-erb provides the system with instructions to make less BMAL and CLOCK. To simplify, we’ll say that BMAL/CLOCK turn Rev-erb on and Rev-erb turns BMAL/CLOCK off. This is what we call a feedback loop. You can think of this feedback system like the heating system in your house. In a home heating system, when the temperature drops below your thermostat setting, the heat turns on. Once the temperature reaches the set point, the heat sensor prevents the heat from running until the house cools back down a little. In our system, BMAL and CLOCK are like the heat and Rev-erb is like the heat sensor. When there is too much BMAL and CLOCK in the system, Rev-erb is activated and prevents more BMAL and CLOCK from being made. Like heat in a house, proteins don’t last forever, so eventually the supply of BMAL/CLOCK is depleted and Rev-erb stops blocking BMAL/CLOCK production. 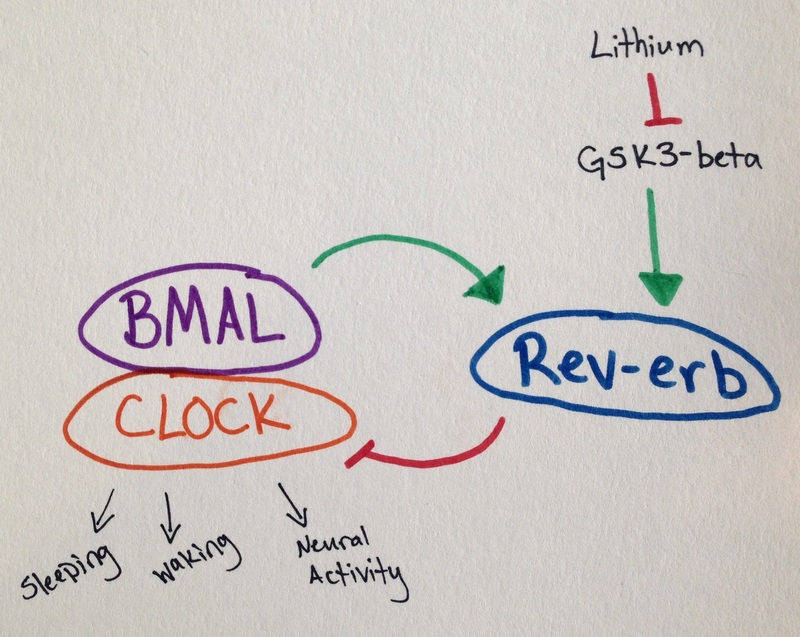 And instead of cycling between a heater being turned on and off, the BMAL/CLOCK/Rev-erb feedback loop provides your body with a pattern for sleeping and waking, and for other important things like neural activity and metabolism. BMAL and CLOCK turn on Rev-erb, and Rev-erb turns off BMAL and CLOCK. 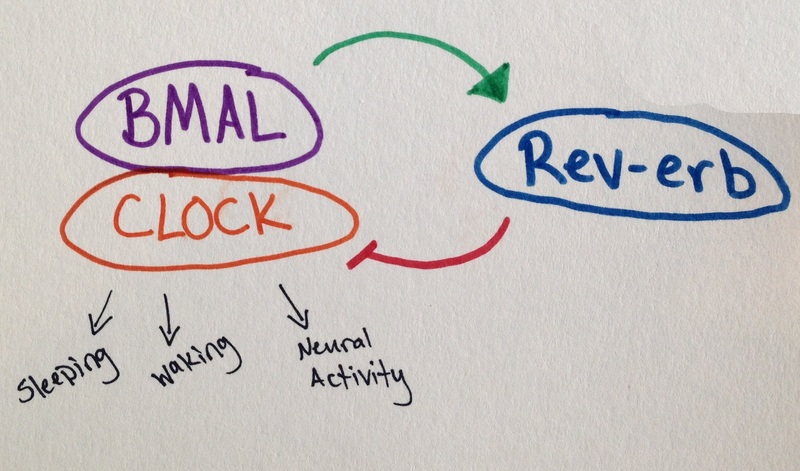 This is called a feedback loop and creates cycling protein levels which contribute to your circadian rhythms. So here’s where it gets interesting. In 2006, a group of researchers in Pennsylvania discovered that yet another protein, called GSK3-beta, can help turn Rev-erb on. Coincidentally, researchers have known for a long time that lithium, the first effective treatment for bipolar disorder, inhibits GSK3-beta. Thus, the group in Pennsylvania was able to develop a new understanding of the circadian clock, where lithium is inhibiting Rev-erb by inhibiting GSK3-beta. This means that BMAL and CLOCK are more active, and somehow this stabilizes the out-of-control circadian cycling. In short, it appears that lithium may be an effective treatment for bipolar disorder at least in part by restoring regular circadian rhythms to the body. GSK3-beta turns Rev-erb on, and Lithium turns GSK3-beta off. The upshot of this is that Rev-erb is less active and BMAL/CLOCK is more active. In many patients this appears to normalize circadian rhythms. Although lithium was a breakthrough medication and continues to be extremely effective for many people, it isn’t a solution for everyone. It cannot be used by women who are pregnant or breastfeeding, and it can cause unpleasant side effects for some people. Understanding how lithium works could lead to better or more specific medications down the road. For instance, knowing that GSK3-beta targets Rev-erb opens an avenue for developing a new medication that specifically targets Rev-erb. Maybe this hypothetical new drug would have fewer side effects or be safer for more people. Of course, this isn’t the whole story. Even though we know that lithium targets GSK3-beta, we also know lithium isn’t very specific – it targets a number of other molecules in the body as well. Even GSK3-beta isn’t very specific – it has effects not only on circadian rhythms, but also on growth and development and metabolism. So while Rev-erb might be one piece of the puzzle, it’s probably not the only piece. This is why researchers continue to study every little part of each little pathway. We are constantly learning more about how the body works at a molecular and cellular level… and even on a larger scale. The road to understanding bipolar disorder or any mental illness will be a long one, and it will take many scientists and physicians and patients, all with different ideas and questions and points of view, to get there. Editor’s note: In order to make the science accessible to everyone, we tried to explain the molecular pathways in the simplest possible terms. This means we lost some of the intricacies that our fellow molecular biologists (and others) may be interested in. For instance, Rev-erb does not directly “turn off” BMAL/CLOCK; it is an orphan nuclear receptor which acts as a transcription factor. Furthermore, there are different subtypes of Rev-erb; the beta-subtype is actually a transcriptional activator rather than a repressor. (Aren’t you glad the entire post wasn’t like this?) If you’re interested in wrestling with the details, check out the links within the post, leave a comment, send us an email (science.aces15@gmail.com) or tweet at us (@scienceaces). I had wanted my first piece on the blog to be about something – well, really, anything – else. If I write about another topic first, I can introduce the readers to my personality instead of overwhelming them with something I’ve been afraid to talk about for a long time. But the truth is that simple. I am just afraid because this is me. I’m Dr. Jezebel and I have Obsessive-Compulsive Disorder (OCD) and anxiety. I didn’t want to tell you about my OCD or anxiety because I thought it would make you like me less and not read anything else I had to say. I’ve struggled with this condition, and judgment from it, for my whole life. But today I’m sharing my story of what living with something that is classified as a mental health condition is like. Anyone can have a mental health condition. I’ve come to loathe the stigma that surrounds mental health conditions because they are silent conditions. When you break your leg, you get a cast and people can see that. They can even sign it and show how much they support your recovery with little hearts in silver sharpies. Alas, you don’t get a cast for the things that ache in your psyche and, more importantly, nobody asks you how you’re doing in your recovery. If they do ask, more often than not it’s with a delicate, gentle pity tone. I despise the pity, but it is only one extreme. Pity and apathy comprise a double-edged sword in the problem of recognition and acceptance for mental health conditions. Profound things in life often exist in great juxtaposition. For me that has been true with pity and apathy in regards to my anxiety. I’ve had people that have been too sensitive and sheltering of me once they know. Their overbearing nature suffocates me and makes me feel like a helpless child. I’m not helpless; I have been living with this so much longer than this person has been living with me and my anxiety. Then there are the callous, apathetic ones that tell me I’m being a baby and making things worse for myself because anxiety’s not an actual issue. Or, worse still they’ll say, “Why can’t you just control it? Anxiety’s not even a real problem. Just get over it.” For me, apathy hurts more, because these people do not know what it is like to live with constant uncertainty. At least oversensitive encompasses awareness and recognition, albeit excessive. The apathetic seem crueler because they feed into the self-doubt that accompanies many mental health disorders. This self-doubt has lead me to ask myself numerous times, is this my condition or me? Are my feelings legitimate? Is this normal worry that everyone feels or is it because of my anxiety? Does feeling this was make me weak? These were hard questions I struggled with when facing the both types of people. No one should feel ashamed of themselves for a condition they have, be it a broken leg, diabetes, cancer, depression, anxiety or anything else. For this reason, I will share my personal…journey…with anxiety. I was very tempted to put struggle, in place of journey, but I feel this undermines my point. I have struggled with shame, sadness, and hate for my anxiety but the awareness I have now is something I would not trade for the world. I did not become aware of my condition until this year, following a return to therapy. I was crying off and on and felt in as though I’d evaporated into a haze of perpetual stress. This was my anxiety of course, as I would come to learn through talking at my therapist. I find, more often than not, therapists lead you to personal discoveries by gently coaxing the direction of conversation. For this reason I say that I discovered my anxiety; I never got an official diagnosis. Due to the nature of mental health conditions there is a spectrum for how a condition presents in people. Some people, through personal awareness and strategy, can manage their condition on their own without medication. Some require light medication or cognitive behavioral therapy. I would compare it to having high cholesterol; some people can alter their lifestyle to rectify the problem while others may have a condition that can only be controlled with medication. I fall into the first category of people who can manage through awareness and lifestyle adjustment. For me, my struggle was not knowing what I would find out when I walked into that therapy office, which was very difficult to do, by the way. I definitely almost cried in the waiting room thinking I was only there because I was too broken to fix this myself. Do I have an anxiety illness? Do I need medication? Am I broken? Did I inherit this brokenness due to some faulty wiring in my own head? These were my personal fears at my lowest point before I realized there is nothing wrong with being different. Just as someone may have blue eyes and someone else brown, maybe my brain is wired differently, but that doesn’t make it bad…just different. And, most importantly of all, it doesn’t matter because it is mine. My discovery, however, did not largely come from talking at my therapist but instead by stumbling through a serendipitous Wikipedia wormhole. I had already been back in therapy when I saw an article on Obsessive-Compulsive Personality Disorder. That’s the one where people are particularly cleanly or count doorknob turns. The article happened to link to OCD and I read through, out of curiosity. It’s a most peculiar, fascinating experience when you find a story that describes your life in front of you on the Internet. If you don’t know how OCD works, it’s an anxiety condition where you become so stressed (obsessed) with a certain idea, event, or outcome that you form ritualistic practices (compulsions) to release the stress and abolish the threat from the stressor. You can also have just obsessions or only compulsions; they need not depend on one another. Reading the Wikipedia page for OCD became more like a list of boxes I could check off on a form. Every single episode of mental health upset or unsettledness was on the page in front of me. The obsessions list reminded me of those doctor surveys you’re given that say “Have you now or ever previously experienced…” and I would have checked off the following. Compulsive Hand Washing: I remember doing this as a kid because if I didn’t (in my mind) I would get horribly sick and die. I would wash them long after they had dried out, cracked, and bled. I appreciate the irony of this now that I’m a microbiologist greatly. In due time I just grew out of it because playing like a kid was more fun. “Dirt don’t hurt” as my mother used to chide me. Fear of Religion: Another check. I had two bouts with this one. The first was probably the most scarring that I remember. I was about ten and afraid that God was equivalent to Big Brother, listening in on my thoughts. The obsession was that if I had a “bad thought”-something that God would find blasphemous such as burning a bible- then I would burn in hell. I had no compulsion to remedy it and this melancholy caused me to run crying to my mother in fits of hysterics. At the worst, I remember my mother crying and asking me what she should do or where she should take me. My mother not knowing how to help me was probably the reason this was the most scarring and I remember being young and afraid she would send me away to a “nuthouse.” I had nothing to fear, but it was a formative moment for me. I, too, grew out of this obsession phase. The second bout occurred several years later where I had to pray every day a certain way or someone would die. The prayer was very ritualistic, practically on the level of organization as a legal document having a preamble and place for amendments to be added. I frequently forgot this one and it would cause me to wait in high anxiety for a day fearing repercussions. But they never came. I grew out of this one as I grew to shed my religious, Catholic upbringing. Sexual Identity Crisis: Ah, my favorite obsession of them all, because it is very silly to me looking back now. This was the obsession that got me to check myself into therapy the first time. This was a very silly fear to have as 1) I had many friends of every orientation you can imagine and I loved them all the same without a single thought to their sexual preference and 2) I knew I was straight. I could not summon the will to care if I liked men women or both but I was afraid to be wrong about myself. I grew out of this one after figuring out some personal management styles to help me when I was upset. I still was unaware that I had anxiety at the time. But there is all was on the screen in front of me. The definition I had already defined for myself as the true meaning of anxiety staring right back at me. You can rationally know something and accept it as fact but nonetheless your body will reject this fact and send you to a worried state of existence against what you mentally desire and will. Discord at its finest. I knew instantly that I had OCD. But why didn’t my therapist tell me? The following meeting in her office she gave me a knowing smile but still refused to say, “you have Obsessive-Compulsive Disorder”. She explained to me that you only ever really get a diagnosis for something if it hinders your ability to function and your day-to-day quality of life. Perhaps I may have gotten a diagnosis during my greater periods of upset in my past, but I had moved on a long time ago from each episode. With my therapist’s silent affirmation I once again fell into the zone of having something but not having it bad enough to be acknowledged. To me, the greatest challenge of mental health conditions is the spectrum and that people adamantly refuse to accept what they cannot see. I am a scientist and I understand this as a rule in my field. Repeatable, visible patterns dictate truth. But the next time you think of mental health conditions, I encourage you to think of the spectrum of light. Sure, you get to see the reddest flames, greenest spring grass, and piercing blue oceans, but there’s infra-red radiating off of our hot skin after a workout and ultraviolet light that gives the most painful sunburns. They’re real and in the spectrum, you and I just don’t have eyes capable of seeing it. As we often say in science, perhaps this just means our means of detection are not good enough and we need better detectors. As much as I hate to say it because it comes off as cheesy to me, an open and understanding mind is the best way to modify our scope of understating. I understand that some people will never believe me because they cannot see my OCD or anxiety. They cannot feel the stress in my shaking, heart-beating-ever-so-fast body. They cannot perceive the unbearable amount of pressure around an anxious person. Furthermore, I understand that you may think I WebMD’d myself and am wrong about myself. Then, back to our double-edged sword of pity and apathy, there’s always the alternative: being perceived as “damaged goods.” One of the most hurtful moments of my life occurred after I opened up to a best friend about my OCD. I told him about my condition and what I had learned in therapy and he later told me that he would not want to date me because if we got married and had children it could pass down to them. To be fair there is a lot more to that story and, spoiler alert, that person is still one of my best friends and, in fact, a very good person. But their misunderstanding was still one of the most hurtful things ever spoken to me. If he understood what I’ve gone through to get to this point I think he’d respect me a whole lot more, enough to know that I am not hindered by this condition and that it’s just one part of the complex, infinite-variable existence I lead. I have OCD. Does it affect me? Yes. But does it affect my overall quality of life?…No. Not at all really. Having an answer has helped me find the peace I needed to accept those times of uncertainty. I already knew that my anxiousness tends to be irrational. I already knew fairly well how to calm myself from that sort of state and move on. I have since moved on from therapy with a newfound understanding of myself, mental health conditions, and life itself. I am not my “disease,” but it is a part of me. I don’t believe in limits and I intend to live the fullest life I can with the only body and mind I have, my universe detectors. 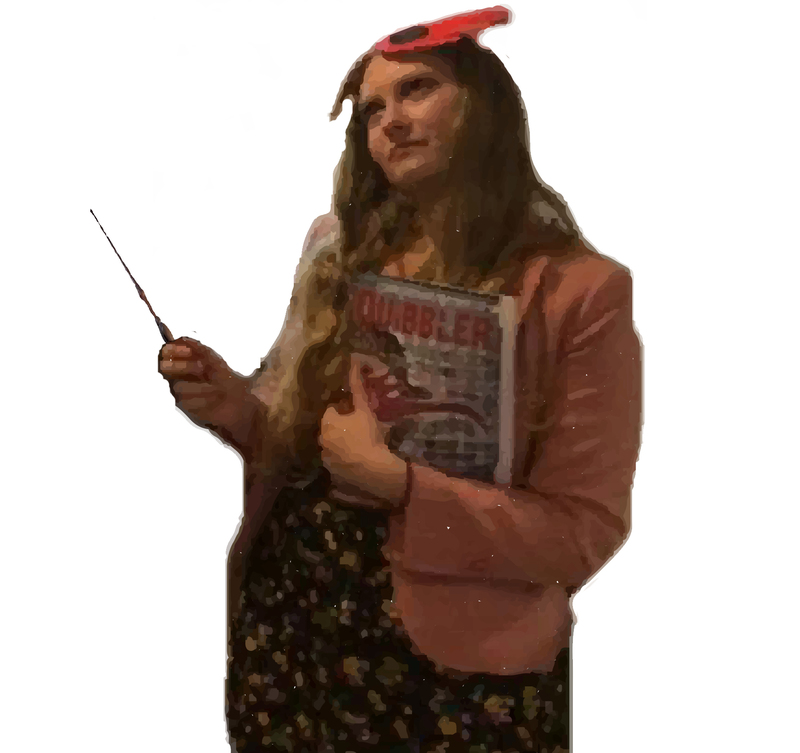 So, frankly my dears, if someone tells me that I’m not a good little universe reader because of anxiety, I don’t give a damn and neither should you. For all the people out there who have known mental health conditions in one way or another, this was especially for you. Know you are not alone, ever. If you have ever seen the movie “Mean Girls” or been a teenage girl yourself, you have an inkling of the pain and social pressures of female adolescence. Tina Fey actually based her screenplay for “Mean Girls” on the non-fiction self-help book, “Queen Bees & Wannabes: Helping Your Daughter Survive Cliques, Gossip, Boyfriends & Other Realities of Adolescence” by Rosalind Wiseman, which explores the horrors that young girls experience at the hands of each other. The reality is that while the antics portrayed in “Mean Girls” may seem trivial, they can combine with other factors to have severe long-term effects on psychological and physical health. I am writing this article from the perspective of the anxious teenage girl I used to be who truly believed that if I could become less fat everyone would like me and my life would change. Teenage me had the perfect checklist for developing anorexia nervosa, a disorder characterized by a significant reduction of food intake resulting in extreme weight loss: a 14-year-old female from a Western society with a serious social anxiety disorder, perfectionist tendencies, and years of bullying (by other girls) for being fat, who also did sports requiring a slim figure. Some or all of these risk factors are present in 95% of cases of anorexia nervosa as well as bulimia nervosa, another eating disorder distinguished by starvation punctuated by episodes of binging and purging. The third major eating disorder, binge eating disorder, has a slightly different but fascinating etiology and is essentially an addiction to food. When we look at the statistics we can see that my story is not unique. Even though eating disorders are diagnosed in only a small percentage of teenagers, anonymous surveys have shown that over one-half of teenage girls and one-third of teenage boys have used unhealthy weight control techniques (skipping meals, fasting, vomiting, taking laxatives). 91% of surveyed college women have tried to control their weight through dieting, with 25% of these women using binging and purging in these attempts. This means that despite the relative “rarity” of eating disorders (anorexia ~1%; bulimia ~3%; binge eating disorder ~5% of the general population), a large majority of young people develops some kind of adverse relationship with food and appearance. Most of the people surveyed indicated that peer and societal pressure to be or look a certain way led to their unhappiness with their weight and provoked their dieting behavior. This brings us back to “Mean Girls,” as young women are often the most vicious perpetrators and unfortunate victims of unattainable body image. I would love to have an open discussion on how we as a society could change our views on body image, especially for young women, but it is just as important for us to understand the science of eating disorders. The scariest statistics of all are the mortality rates associated with eating disorders. Anorexia has the highest mortality rate of any mental illness. One in five of these deaths is due to suicide or substance abuse, the other common causes being starvation or heart problems. I couldn’t believe it when I first learned that indeed there are thousands of young women dying of heart attacks. Apparently, after a certain degree of starvation, our bodies will actually begin to eat our heart muscle for energy, reducing its pumping strength. To make it worse, electrolyte imbalances from poor diets cause abnormal heart rhythms. Individuals with bulimia are much harder to diagnose because they are often within normal weight ranges, but it is estimated that the mortality rate may be as high as in anorexia, predominantly caused by suicide. I had a few questions after reading all this information. First, why do some people develop full-blown anorexia or bulimia while others try dieting or binging and purging a few times and stop? Second, why is the suicide rate so high in individuals with eating disorders? The answer to both of these questions may lie in the fact that most people with eating disorders have another diagnosable psychiatric disorder, including major depression, anxiety, obsessive-compulsive disorder, bipolar disorder, or schizophrenia. In some cases it is unclear which came first, but perhaps these psychiatric disorders predispose people who are already unhappy with their bodies to take extreme behavioral action to try to fix their problem. The same imbalances in neurotransmitters found in people with depression and anxiety, particularly low serotonin and dopamine levels in the brain, are found in people with anorexia and bulimia. Food is associated with pleasure and normally increases these same neurotransmitters as part of a reward system for eating, but dietary restriction and the associated “pleasure of looking and feeling thin” actually reprogram the brain to feel more pleasure in the absence of food or after purging food. Hunger, rather than motivating people with anorexia or bulimia to eat, itself becomes the rewarding sensation. Interestingly, the exact opposite pathways are activated in binge eating disorder, in which food basically becomes an addictive substance as potent as many drugs. The answers to my questions may be in the addictive and psychiatric properties of eating disorders, which make them difficult to quit and could explain the high suicide rate in these disorders. So how do we treat eating disorders? We can’t just push all the “Mean Girls” in front of busses to get rid of one the causing factors. The strategy used in a lot of cases is forced inpatient hospitalization, to treat the medical complications and teach patients that food is important to be healthy and to train them to make eating a regular habit. Unfortunately, this means the lack of connection between food and pleasure continues even after successful “recovery.” Sadly, if we scan these patients’ brains even years after treatment, we can see no activation of pleasure centers in response to food. This makes it incredibly easy for patients to fall back into old dieting patterns, because the anorexic or bulimic pathway is still intact. To avoid this, we need to help people change the way they think. What helped me was cognitive behavioral therapy, which also happens to be the most common form of treatment for eating disorders. Briefly, the cognitive component of the therapy addresses thought patterns such as “I can only be happy if I lose weight” and replaces them with ideas such as “my self-worth doesn’t depend on how much I weigh.” The behavioral component changes the habits of starvation or binging and purging and replaces them with healthy eating habits. This kind of treatment is more effective because it changes the emotions and thought patterns that are perpetuated in eating disorders while simultaneously altering the habitual behavior. This therapy helps restore the connection between food and pleasure, and reestablish the pathways in the brain that reward healthy eating. It is also important to treat the underlying mental illnesses and to have a strong support system of friends and family to maintain the healthy habits. I mostly leaned on my two best friends, but the other powerful, unexpected support system was other girls who had recovered from anorexia. When I was at my thinnest, I felt invisible and alone before I would admit to anyone I had a problem. I had girls come up to me at least once a week recognizing the signs, telling me their stories, and offering help and support. These “nice girls” helped save my life.